GN7 Mysteries of the C.H. Locutis mentioned to me that your stepmom (?) might play, what do you think the chances are of that? How did you like Wookiee Life Day? I loved it... Made me sorry I missed the first one. When and how did you first dream up Greep? 7/12/04 is when I started it. Basically, I had been reading a web comic pvponline.com and liked the parts where he would have his characters playing RPG characters (at the time I think it was City of Heroes). Well, I liked it a lot, and I found out it wasn't a CoH strip. I thought a SWG strip would be funny if I could draw it decent enough. I then drew it up on a piece of paper based upon events that had gone on in the game. Just like you'd expect, you can hear a lot of good stories just sitting in a busy cantina, or listening to guild chat. I wanted it to have the clean look that PvP has, so I scanned it in and touched it up and submitted it in the guild forum to see what people thought. I just made up the name, I wanted it to be funny sounding and yet somewhat believable Star Wars wise. Are the characters based on people/toons you know? Actually the Twi'lek Rifleman was kinda based on Wryan. Sort of the "normal" one compared to the rest. The Wookiee is me. In'te, the twi girl dancing. The twi in the camp with the nightsisters was base upon a conversation I heard in guild chat, I don't recall who it was though. The drawing of the guy was directly from U'a though. There hasn't been a lot of character development yet really.. Mostly Greep, and the "Wookiee", and the Twi Guy. How far down the road have you planned Greep�s development? hehe not very.. Its pretty much make it up as I go. I have some ideas about how I'd like certain characters to act, but aside from that no. I usually have an idea about what I want to draw, or some situation. Then I just try to work it into the panels. The tortons in ep 13 originally were tusk cats. But being chased and trampled by a torton is just too comical. Tell me about your break from SWG, if you will. Why did you quit? Why did you come back? Well, I left for several reasons, some of it was RL related as I thought I'd have to move soon. Mostly it was the revelation of the Jedi grind. I thought it would be something more... quest based than just grinding xp. It�s not much different than it was before really, its just a different grind. I was kind of put off by the idea that AFK macro grinders and resource leeches would likely be our first Jedi, that just made me ill to think about. And, I felt that I had pretty much done everything, not that I had really had, but I knew it wouldn't be much different that what I had already experienced. What brought me back was the idea of playing with my dad and my kids. Are you still working on your history of Galatorbria project? How's it coming? Yeah, I had been working on it for a while. I haven't really gone too far into it. I thought maybe it could be a nice trivia type thing. It would be nice as a FYI kind of page on the website too. Yeah it does. I'm probably more active than I'd usually be because I get to see and hear and interact with the group. Had I stuck it alone I think I'd probably have never stuck with it. It�s kind of dumb, but I like it when people ask for me to participate. I guess it�s the whole "needy" kind of part of being human. Everyone wants to be liked or wanted around. I've only been a part of GTB. I hadn't really had an offer into any guilds before GTB. Drephe wanted more crafters in the guild. I was skeptical, I was afraid I'd get into something that was entirely PVP oriented and I was mostly crafting (a dangerous prospect). As it turns out things went pretty well. 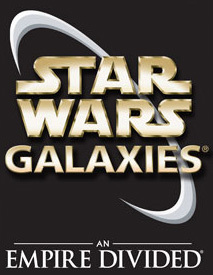 SWG related content copyright 2003-2005 by Sony Online Entertainment.